Millions of Americans suffer from back pain! Consequently, there are lots of people looking for a cure! If you’re looking for a relief of back pain and trying to avoid harsh chemical containing medications, look no further! This method of pain relief is derived from ancient Chinese Acupuncture. Acupuncture is a medical practice that is the stimulation of certain points in the body to cause a reaction in a separate part of the body. This practice often uses needles penetrating the skin to alleviate pain or to treat health conditions. The theory and practice of acupuncture derive from ancient China. It was first mentioned and recorded in documents dating a few hundred years prior to the common era, about 6000 BCE. Similar to acupuncture, reflexology uses a system of energy flowing channels and meridians to stimulate another part of your body. Jin Shin Jyutsu utilizes reflexology in a different fashion. Reflexology is used to stimulate other parts of the body that you might be experiencing pain in or any kind of discomfort. It relieves inflammation and other components of a variety of health issues. However, Jin Shin Jyutsu has a different effect; it can be used to give you a boot on energy, mental clarity, and balances your emotions. This practice helps us become more familiar with our awakening. We can harmonize and balance ourselves using the Safety Energy Locks (SEL). SEL is a system of 26 different energy points throughout the body. Sometimes energy gets piled up and stuck in one of these specific points. There are flowing channels of energy that run throughout our body and connect to the SEL’s. Science refers to this as the primo-vascular system, but it is simply the flow of energy throughout your body. 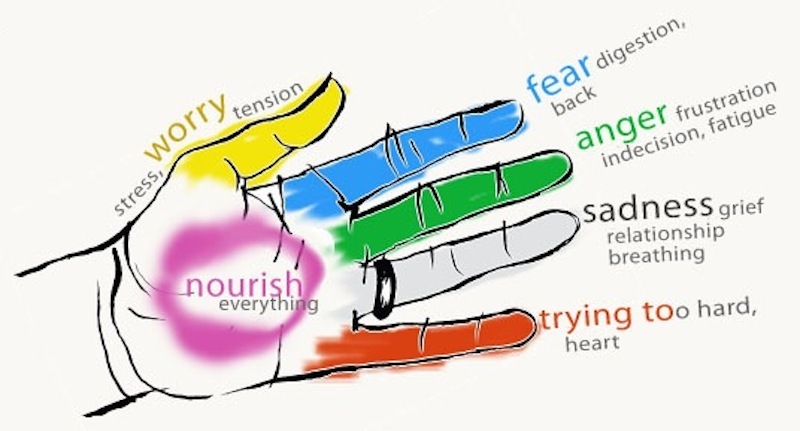 Many of these energy pathways run through your fingers. If you can stimulate SEL’s, which you can, then you can harmonize the energy flowing throughout your body. Doing so can bring about emotional relief, a sense of clarity, and even a boost in energy! Here’s how to do it. Hold your Thumb for a few minutes with your other hand to eliminate worry and depression. It is also beneficial for digestion, stress, tension in head, shoulders, and lungs. Hold your Index finger to eliminate fear and self-criticism. It is also beneficial for your jaw, teeth, gums, constipation/digestion, bursitis/tennis elbow, backaches. Hold your Middle finger to eliminate anger and irritability. It is also beneficial for general fatigue, vision, nursing mothers, headache in front of head and indecision. Hold your Ring finger to eliminate sadness and grief. It is also beneficial for respiratory problems like asthma, skin conditions, ringing in the ear, excessive mucus and negative attitude. Hold your Little finger to eliminate anxiety. It is also beneficial for heart conditions and severe bloating.